Photo: Ride an abra across Dubai Creek to bargain at the gold and spice souks. Dubai International Airport recently surpassed London’s Heathrow as the world’s busiest international air travel hub. If you can arrange it, Dubai is a great place for long layovers between long-haul flights. Dubai sits in desert country but that’s part of its appeal. It makes a handy stopover point for lazing on a beach, doing wheelies in the sand with a dune buggy, bargaining with merchants at a traditional souk or taking high tea in the world’s tallest building. But beware: “Dubai has only two seasons — hot and hotter,” my for-hire driver said with a shrug and a smile while taking me on a private tour of the city (about $125 U.S.). Temperatures had already reached 91 degrees Fahrenheit at 5 a.m. on a mid-September day as my plane arrived in Dubai from Johannesburg. I had scheduled two days between destinations en route home from South Africa to Seattle via the polar route. ✔️ Visit Burj Khalifa, the world’s tallest building. The Burj Khalifa is the icon of Dubai’s fast-growing vertical cityscape. It’s the world’s tallest structure at 2,717 feet (828 meters), making it nearly twice as tall as New York’s Empire State Building. The building was completed in 2010 and houses a luxury hotel, residential apartments, corporate offices and suites. It takes a little over a minute by high-speed elevator to reach the observation decks (124th, 125th and 148th floors). Splurge by reserving a window table at the building’s 122nd story At.Mosphere restaurant. Prices aren’t cheap but then it’s all about rooms with grand views. Fronting the building is the Dubai Fountain. It has quickly become popular for its choreographed, multi-colored displays — especially at night. ✔️ Ride an abra across Dubai Creek to bargain at the gold and spice souks. Getting to the most popular of the city’s traditional souks is more than half the fun when you ride across Dubai Creek on a motorized abra. These small wooden water taxis can squeeze in 16 to 20 people seated shoulder to shoulder. 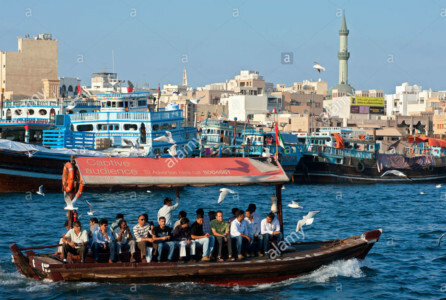 Scores of the boats work the Creek daily, taking about five minutes to cross from Bur Dubai to the Deira district with its souks or small markets selling everything from gold and spices to perfumes and belly dancer outfits. Hone your haggling skills. Few things are sold at listed prices. Take a wharf walk to soak up the many fascinating street scenes. Buy a bottled beverage along the way to hydrate. ✔️ Book a desert safari. Consider taking a trip into the surrounding desert if you have a lengthy layover in Dubai. Tour options range from wildlife watching and sand-skiing to dune bashing — racing four-wheelers up and down the many steep sandy slopes. Another desert-trek alternative is sunset safaris. These are half-day, late evening outings to pseudo Bedouin encampments featuring buffets set around campfires. Entertainment varies from camel rides and belly dancing to falconry. One operator offers an exceptional after-dinner treat simply by turning out the lights. Stargazing in the unpolluted dark of a desert night is an unforgettable experience. Burj Khalifa: Head for the lower level of The Dubai Mall near the food court and walk to the Burj Khalifa ticket counters. Book online in advance to avoid the long lines of daily visitors. That also may earn you a discount; Access the At.Mosphere website to make a dinner reservation. Abra Rides: Make your way to any of these departure points: Deira Old Souk Abra Station, Bur Dubai Abra Station, Sabkha Abra Station. Ticket prices are minimal: 1 dirham or about 27 U.S. cents per person per trip. No reservations are required. Simply pay the abra operator and board. The boats leave when both benches are full.